It was my recent understanding that SPML v2 is DOA. 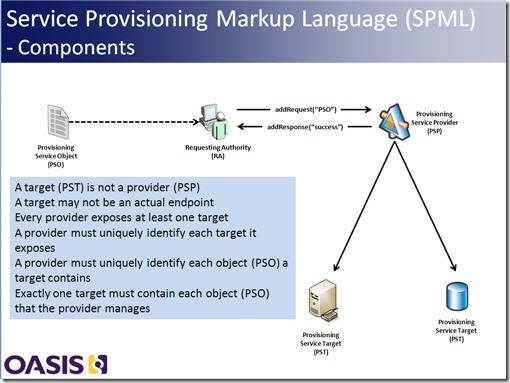 The primary goal of SPML is provisioning without the use of proprietary connectors. The reality is that SPML is not currently viable for building useful, standards-based provisioning services because it is too complex and places too much of a performance burden on the connector. See http://identityblog.burtongroup.com/bgidps/2010/02/spml-is-on-life-support-.html for more details. @Jon I am aware of that Burton Blog posting. My blog postings, and my comments on that Burton Blog entry, are my responses to that fact that I do see the need for SPML (or something that is SPML-ish and standardized) in the community. The entire point of SPML is to get away from the connector architecture that is proprietary in nature. Agree that there is an immense amount of complexity (to the point of being unusable) in some of the operations that are possible with SPML; "Search" and "Updates" come to mind. But as Mark noted in his Burton blog entry, a potential way forward is to Profile the standard so that there is a simpler subset of operations that are usable. But ultimately my response is that if SPML cannot be salvaged, let's put a stake thru its heart and move on. But the alternative of staying with the proprietary connector architecture of provisioning products is not something that is viable for Enterprises. We need to either make SPML work or work on an alternative that is open, standards-based, interoperable and has vendor support behind it.